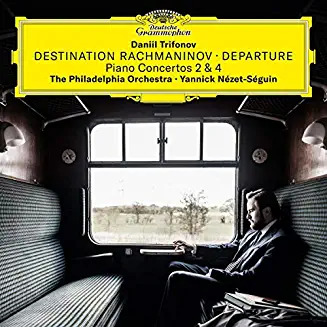 "Daniil Trifonov's captivating Romantic soul and limitless virtuosity are thrillingly displayed in Destination Rachmaninov - Departure, a musical exploration of two of [the composer's] piano concertos - the heart-rending Second and the cosmopolitan Fourth - supported by Yannick Nézet-Séguin and the glorious Philadelphia Orchestra. Trifonov contrasts the harmonic sophistication of the early Second Concerto, and the rhythmical drive of the Fourth, with Rachmaninov's effervescent transcription of three movements from Bach's Partita for Solo Violin in E Major. 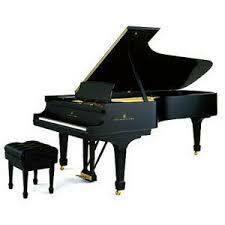 'Rachmaninov mastered the musical languages of the composers he most admired.' explains Trifonov, 'and with humour, reverence, brilliance and affecting sentiment, created his own very Russian syntheses. In that sense, his music is both a journey and a destination.'" The recording offers the presence of being in an actual hall with the piano recorded with more ambience of the building - not microphones close up - but enough to capture every note. As you would expect, Trifonov is exactly in his element with this music offering clarity and the ultimate technique required. The Philadelphia Orchestra under Nézet-Séguin is as lush sounding as one would expect, and Trifonov follow's in Rachmaninov's footsteps with his allegedly favourite orchestra. Right up my alley, Lance! Thank-you!